Learning about first aid for dogs is something that many of us tend to put off, I was in that same boat a few years ago until I took the step and did a first aid course. This was money well spent, now I'm better prepared if something happens to my little doxie. 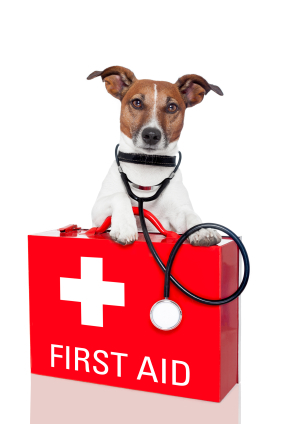 After completing the course I decided to put this page up, to help others learn more about first aid for dogs. It only takes a little effort on your part, but its well worthwhile. You never know when the unexpected can happen and your dachshund needs help, or perhaps your training will help someone else's pet, so it pays to be prepared, there are courses available some on-line. Often the result of an accident, causing injury, your dog will have glassy eyes, shallow breathing and his extremities will be cold, gums will be very pale, pulse will be rapid and weak, respiration will be rapid also. Ensure airway is open. Cover with blanket to keep warm. If your dog is unconscious try to have his head lower than his body. Seek veterinary assistance immediately. Often happens to dogs left in enclosed areas such as a car in hot weather. Breathing will be rapid and labored, he may be panting and dog will be near collapse. Sponge or wet dog with cool water if possible put under shower, or hose, do not use ice water as this will cause more problems. If your dog is conscious, offer small amounts to drink. When the dog’s temperature reaches 103F stop the cooling process as cooling will continue naturally until dog has recovered. Your dog should be kept fairly quiet for the next few days, to fully recover. It is always a good idea, to have your dachshund checked by you vet. If bleeding is slight but sufficient to warrant first aid apply styptic powder, to stop bleeding. If bleeding is profuse, use a clean cloth as a pad, apply pressure, if possible elevate, and seek veterinary assistance immediately. This is a serious problem so seek assistance from your vet immediately. Some symptoms include weak or rapid pulse, coughing up blood, pale gums, bleeding coming from nose, mouth, blood in urine,difficulty standing. With any fracture, limit movement to stop any further injure, control any bleeding and ensure your dog kept, warm and comfortable. If your dog is unable to stand, you will need to lift him carefully on a flat board and take him immediately to your vet. Its important not to restrain your dog, clear the area around him so he can't injure himself and it's a good idea to time the seizures. Once the seizure has stopped, keep your dog warm and comfortable then contact your vet for advice. This is a common dog emergency, usually symptoms can be breathing difficulties, coughing, choking sounds and pawing at the mouth. First thing to do is check your dogs mouth for foreign objects, if there is something present then use pliers or something similar to try and remove it, be careful not to push it further down. Another option you could try is to hold your dog upside down by their hindquarters, sometimes the object will fall out. If this too is unsuccessful then complete the Heimlich manoeuvre. The best way to do this on a small dog is to hold them upside down like before and with a sharp punch downwards towards the diaphragm, this often works. If all this falls then get your dog to your vet as soon as possible. If you suspect that your dog has eaten something poisonous contact your vet immediately. This service operates 24 hours per day, there is a charge for this service. You will need to have ready all the information about your dog, symptoms, what substance they ate and how much, approximate time when consumed. Also if you have the container of the substance handy for reference. From this the toxicologists will be able to tell you what call of action should be taken - such as induce vomiting if appropriate. Remember first aid for dogs is useful for small problems and as a first response person, but should not take the place of your vet, always seek his/her advice by phone and if you are concerned or the injury is serious take your dog immediately to your vet. Take the hassle out of organizing equipment for a pet first aid pack, by purchasing an excellent prepackaged kit with a range of first aid equipment. The pet first aid kit below has 45 items all are human grade products, it also has a very useful first aid guide. The electronic ear thermometer below provides you with a fast and accurate way to take your dogs temperature. The First Aid Book for Dogs & Cats - provides you with the basic knowledge of pet first aid from cleaning cuts to performing CPR. This book also includes an A to Z guide of some of the common and unusual conditions and injuries you may face with your pet. This dog owners Handbook has been a best seller for many years and has been updated to include all the latest information on the subject of dog health care. It includes a full chapter dedicated to dog emergencies and details what to do. Also has many pictures and drawings to show you what to look out for. A must have for dog owners.